Crisp, freshly laundered napkin is an essential part of a well set table. Try out this simple art to make the setting look elegant. Indeed this will impress your mother immensely. 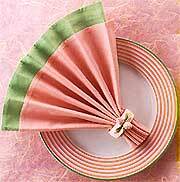 All you need is a well ironed, starched fabric napkin. Pick up any shade. It may be tuned to mom's taste, or to your own, but they need to be spotlessly clean. And a napkin ring, or a ribbon. Fold up the edge nearest to you to meet the top edge. Rotate the napkin so that the folded edge is on your right. Make equal-sized accordion type pleats all the way up to the top of the napkin, starting with the edge nearest to you. Insert the napkin into the ring. Or, tie with a ribbon or cord and spread out the pleats. And place it at the center of the plate as shown. TheHolidayspot Exclusive. Treat your Mother as The Queen Of Feast! Click Here for this wonderful Dinner Idea !